Netanyahu orders financial penalty against the PA, which is already struggling to pay off staggering debts, in retaliation for ICC bid. 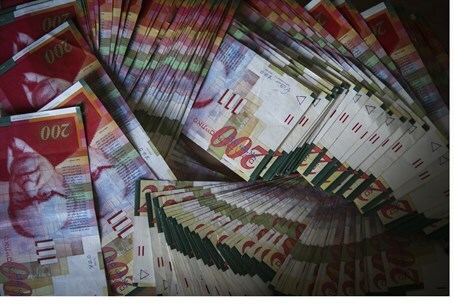 Israel froze the transfer of about half a billion shekels (127 million USD) to the Palestinian Authority (PA), a political source told Arutz Sheva Saturday night, in retaliation for the PA's official request to join the International Criminal Court (ICC). He said the decision was made Prime Minister Binyamin Netanyahu's orders and constitutes the Israeli response to the PA's unilateral moves. "The funds for the month of December were to be transferred Friday, but the government decided to freeze [the transfer] as part of the response to the Palestinian move," the official said. The Palestinian Authority (PA) formally presented a request to the United Nations on Friday to join the ICC, a move firmly opposed by Israel and the United States. Earlier Saturday, a government official told AFP that counter-moves against the PA at the ICC - including filing war crimes against it for its atrocities against Israelis and its own people - were on the table. "This decision is a new Israeli war crime, but we won't back off in the face of those pressures," he told AFP.